In PowerPoint, you can add sounds to animations or hyperlinks, described here. You can also play sounds automatically when a slide appears. You must have previously added an animation effect to the text or object before adding a sound to the animation. Click the slide that contains the animation effect to which you want to add a sound. 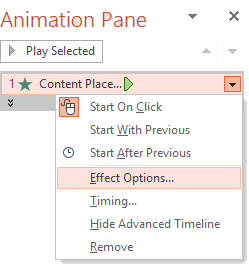 Select the effect in the Animation pane, click the down arrow to the right of the effect, and then click Effect Options. To add a sound from the list, click a sound. To add a sound from a file, click Other Sound, and then locate the sound file that you want to use. In the Custom Animation task pane, click the arrow to the right of the animation effect in the Custom Animation list, and then click Effect Options. To apply the action settings after the hyperlink is clicked, click the Mouse Click tab. To apply the action settings when the pointer is resting on the hyperlink, click the Mouse Over tab. Select the Play sound check box, and then click the sound that you want to play.